Chard (Beta vulgaris cicla) is a biennial plant with a strong taproot and large leaves clustered on a short stem near the soil surface. It is really a foliage beet and is grown as an annual. Cultivation has changed its habit of growth so that leaves instead of roots are best developed. The leaves, for which it is grown, have large, fleshy leafstalks and broad, crisp blades. It withstands the heat of summer better than most crops grown for greens. The leaves are prepared like those of spinach by boiling and are canned for winter use. The petioles and midribs are frequently cooked and served like asparagus. Seed was sown at Norman, Okla., Apr. 19, in rows 3.5 feet apart so as to permit cultivation with a horse-drawn harrow. The seed readily germinated in the warm, moist soil and by May 14 thrifty seedlings, 3 to 5 inches high, were abundant. They were thinned to 8 inches apart in the row. 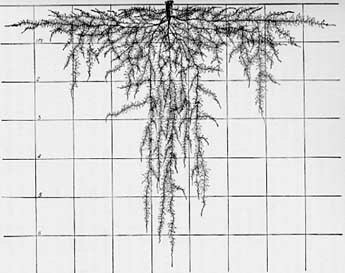 Early Development.--The root system at this time consisted of a taproot which branched profusely in the first 6 inches of soil, giving rise to both large and small laterals at the rate of about eight per inch. These extended outward and usually slightly downward, although a few ran rather sharply obliquely downward. The greatest lateral spread was 14 inches and a depth of 19 inches was attained (Fig. 23). The laterals and the taproot below 6 inches bore unbranched rootlets for the most part; only a few of the stronger ones were rebranched. Secondary laterals near the taproot were about 2 inches long but rapidly decreased in length on the younger portions of the main branches. Fig. 23.--Root system of Swiss chard 25 days old. Half-grown Plants.--The seedlings had developed into vigorous, rapidly growing plants by June 7. They were 1 foot tall and each had 8 to 10 leaves. The larger leaf blades were 4 inches wide. The strong taproot (15 millimeters thick near the soil surface) and some of its larger branches had become somewhat fleshy. The gradually tapering taproot penetrated, with small irregularities, directly downward to a depth of 45 inches. As before, the largest branches were on the first 6 inches of the taproot. Many of these had a horizontal course throughout and branched very profusely in the moist, mellow, surface soil. A maximum spread of 2.5 feet was attained. Other laterals turned downward within 1 foot from their origin and pursued a generally vertical course parallel to that of the taproot to depths of 2 to nearly 3 feet (Fig. 24). The portion of the taproot below 6 inches was very well branched, some of the branches exceeding 1 foot in length. Their direction of growth varied from horizontally outward to vertically downward. The larger roots of the entire plant were well supplied with absorbing laterals at the rate of 6 to 12 per inch. Some of the older of these unbranched rootlets were 4 inches long. On the first few inches of the taproot and on some of its larger branches the absorbing laterals were beginning to die. Otherwise the conical mass of soil, 5 feet broad and 3.5 feet deep, was well filled throughout with an actively absorbing root network. The plants were again thinned, this time to 2 feet apart in the row. This reduced competition and permitted better growth of the individuals. Fig. 24.--Half-grown plant of Swiss chard. Midsummer Development.--By July 28 the tall, branching crowns were thickly clothed with a dense foliage. As many as 25 leaves, 1.5 to 2 feet long, were common on individual plants. The taproots were about 2 inches thick. They had increased greatly not only in extent but also in complexity of branching. With characteristic short turns, one taproot penetrated vertically downward, branching freely, to a depth of 4 feet. Here it divided into two rather equal parts but continued its course to a depth of nearly 7 feet. Most of the taproots and their longest, stronger branches did not extend beyond 6 feet, but One was traced to the 7.5-foot level. Accompanied by strong branches, descending parallel with it, the taproot and its profuse laterals occupied a soil volume which, below the second foot, was about 18 inches in diameter and extended nearly to the 6-foot level (Fig. 25). Fig. 25.--Midsummer root development of Swiss Chard. 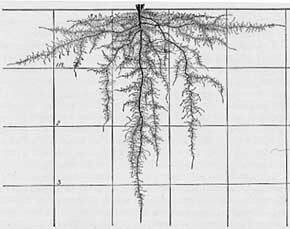 Only one-half of the root system is shown. The part of the root system in the surface 2 feet had similarly increased. Large, horizontal branches, 10 to 15 millimeters in diameter at their origin, extended widely in the surface foot of soil. Running horizontally at a depth of 4 to 8 inches, they extended to distances of 3 to 4 feet (maximum spread, 53 inches) from the base of the plant. Although the small absorbing laterals in the first 2 to 2.5 feet of their course had mostly withered, at irregular intervals (often 0.5 to 2 inches or more) they gave rise to larger branches. Similar branches, of course, occurred farther out on these roots, intermixed with the simple laterals. They grew in all directions, often upward near the soil surface. The longest ones, some of which penetrated almost vertically downward, were 2 to 2.5 feet in extent (Fig. 25). These and their major branches provided a network of roots throughout the surface 2 feet of soil upon which small laterals grew at the rate of 12 per inch. Thus the root system occupied a large soil volume and was well fitted to draw upon the abundant supplies of water and soil nutrients. Root Development of Seed Plants.--The degree to which the old root system of biennial or winter annual vegetable crops deteriorates and to which a new growth of roots occurs is a subject which deserves thorough investigation. The following observations are indicative of the behavior of Swiss chard: Plants grown during 1925 were left undisturbed in the field at the end of the growing season, and the root behavior was examined during winter and spring. No root growth was found until the renewed top growth of spring began about Mar. 15. The environmental conditions during the period are given on page 19. At this time Very large numbers of new absorbing rootlets were growing from the old taproot and its stronger branches. These were from 0.5 to 4 inches long and occurred in clumps on opposite sides of all of the larger roots. They were very abundant to a distance of 2 feet outward on the large horizontal roots and extended 18 inches downward on the vertically descending ones. Many of the older, finer roots were also showing renewed growth. By June 12 the plants were 4 to 5 feet tall. Each had from three to six well-branched stalks 1 to 3 inches in diameter. The soil within 2 feet of the plant, had been very thoroughly exhausted of its available water. The dense growth of roots just described was dead. But at distances greater than 2 feet from the taproot, the horizontal roots were well supplied with an abundance of fine laterals which grew from the finer branches of the old root system. The root system as a whole was no more extensive in regard to the volume of soil occupied than at the March examination.. But branching was more profuse near the extremities of both vertical and horizontal roots. Root Development Compared with Beet.--Compared to its close relative, the garden beet, the root system lacked the network of fine absorbing laterals originating from the taproot in the surface 12 to 18 inches of soil. Neither did the widely spreading main laterals, arising in the surface foot, show the habit of finally turning downward and penetrating deeply. Instead they gave rise to many, large, downwardly growing branches, a root habit quite different from that of the beet. Moreover, long branches, originating from the taproot in the deep soil, were not found, although they are very characteristic in the garden beet. In these and other minor respects the root habits are quite different. Summary.--The root system of Swiss chard is characterized by a strong taproot and many strong lateral branches all of which originate in the first foot of soil. It makes a vigorous growth and early in June occupies a conical mass of soil 5 feet in diameter and 3.5 feet deep. Mature taproots are 2 inches thick, but taper rapidly, and penetrate to depths of 6 to 7 feet. The strong, widely spreading, horizontal branches, with their long and profusely rebranched laterals, thoroughly occupy the soil from near its surface to a depth of 2 feet and throughout a radius of 3.5 feet from the plant. Almost vertically descending laterals, paralleling the course of the taproot, and like it well clothed with branches, ramify a soil volume about 18 inches wide to a depth of 6 feet. Thus the root is well fitted for absorption both in the surface and in the deep soil. During the second year the plant increases its absorbing surface by a dense growth of rootlets on the older portion of the root system. This is further augmented by the renewed growth of many of the finer rootlets already formed on both the surface and deeper portions of the root system. Other Investigations on Swiss Chard.--It has been found at Geneva, N. Y., that the root system of Swiss chard is decidedly more extensive than that of the garden beet. In September, the roots of Beck's Sea Kale chard were traced horizontally to a distance of 3.5 feet. At a depth of 2 feet the taproot was still 4 to 5 millimeters thick. 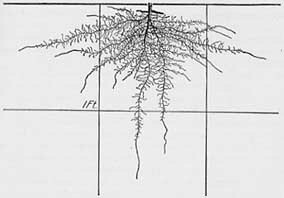 Root Development in Relation to Cultural Practice.--The vigorous development of the very extensive root system and perhaps its ability to adapt itself, like the sugar beet, to different environments, may account for the fact that chard is not as exacting in soil requirements as most other vegetable crops. It is a hardy, vigorous plant, and with a little protection will live through the winter. Any good garden soil is satisfactory for this easily grown plant.